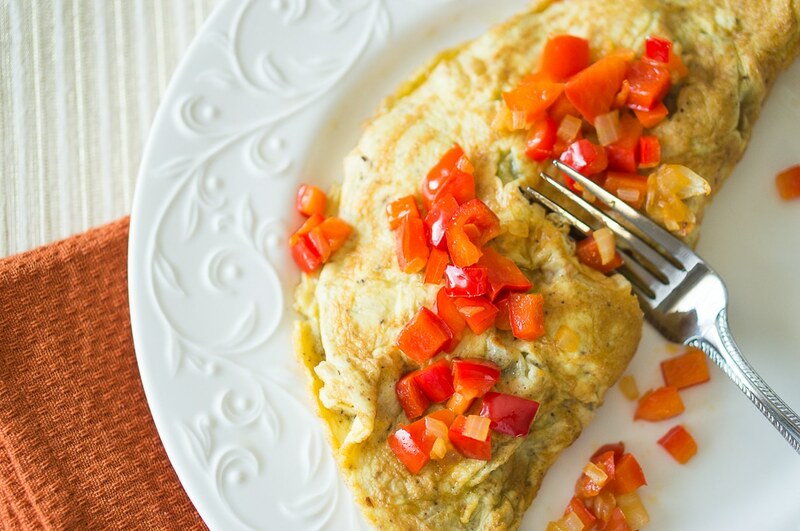 Omelet is a simple, yet filling breakfast. I love that you can create any filling you want and use leftover vegetables in the fridge. Today I added cooked ground sausage from our local farmer, chopped red sweet peppers, onion, and shredded Swiss cheese. I will be adding more omelet variations. Wash and cut onion and red bell peppers. Heat 1 Tbsp olive oil in a skillet over medium-high heat. Add the vegetables, add a pinch of salt and saute for about 3 minutes. Remove from skillet and set aside. Cook the ground sausage in the skillet until cooked through, about 5 -7 minutes. 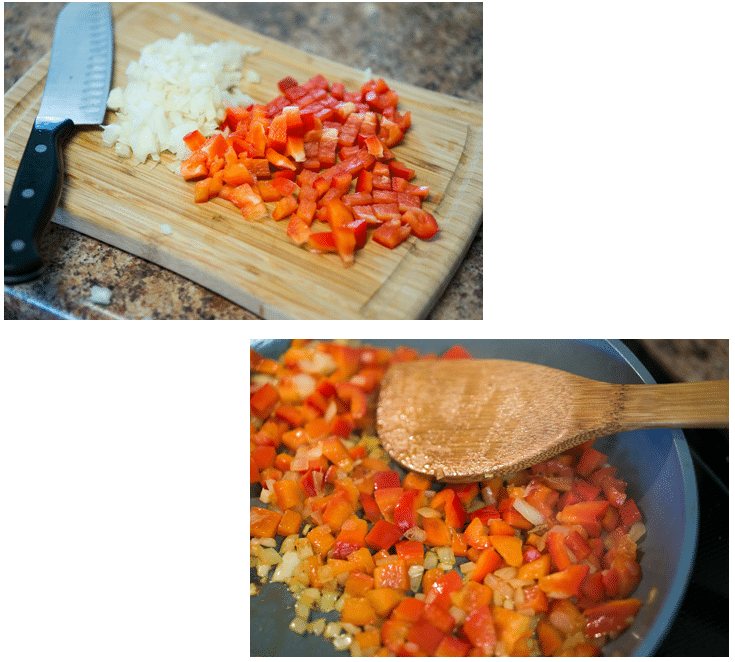 Transfer to the plate with the onion and bell peppers. In a bowl whisk 2 eggs and add a dash of salt and pepper. Heat over medium-high heat 1 Tbsp olive oil in the skillet you cooked the vegetables. Add egg mixture to hot skillet and cook while the eggs sit undisturbed for about a minute until egg mixture is set. With a spatula flip the omelet on the other side and cook for about 30 seconds. Transfer to a plate, add filling & cheese and fold omelet in half. Now you can ring the breakfast bell! While making the remaining omelets, cover with foil to keep warm. Transfer to a plate, add filling and fold omelet in half. While making the remaining omelets, cover with foil to keep warm. Making an assumption that the ground sausage should be cooked before adding to cooked omelet..
Omeletes are a great way to start the day. This recipe sounds delicious! I do love a good omeletes and i’m loving the italian flavors you used. We love omelettes! So versatile and they’re great for breakfast, lunch or dinner! Such a great way to use up what you have in the fridge while allowing everyone to customize it to their liking! Great way to start the day! LOVE omelettes and this flavor combination sounds scrumptious. 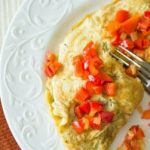 I love a good omelet — they’re like healthy ice cream sundae’s — you can fill them with anything! This one with sausage is right up my alley. Oh yum! I love peppers, sausage, and onions in my omelets! This looks like a great way to start the day! Such a great breakfast! I even add a bit of salsa to mine. What a lovely looking omelet. I can’t wait to make this for the kids. I love omelets and just had one today. You can’t go wrong with sausage, peppers and cheese! Yum!